When the prospect of participating in Foodbuzz’s monthly 24, 24, 24 arose again a couple weeks ago, the first thing that popped into my head was throwing a chicken and waffles party. 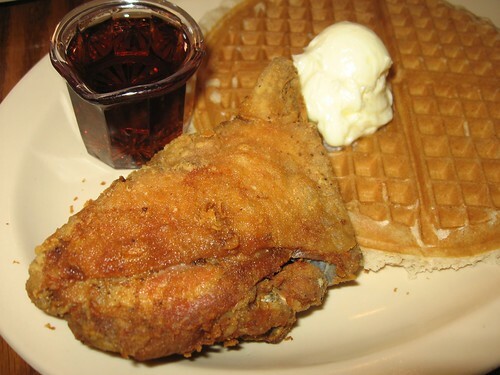 Fried chicken and waffles is one of my favorite meals in the whole world, and being from Southern California, I was first introduced to this combination at the world-famous Roscoe’s Chicken and Waffles in Hollywood. 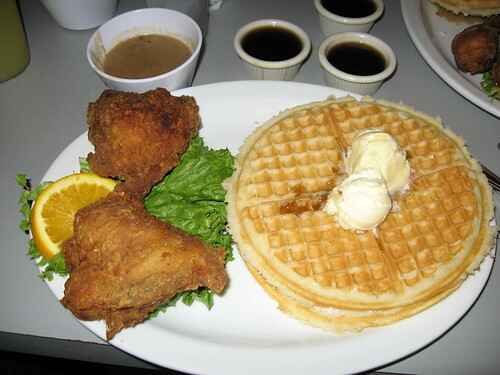 Personally, I think Roscoe’s waffles are much better than their chicken, and the real secret to Roscoe’s greatness is in their amazing syrup. When I moved up to the San Francisco Bay Area 10 years ago, it was hard to find a decent substitute, and the Roscoe’s that was in Oakland at the time was a substandard knock off of the L.A. original. 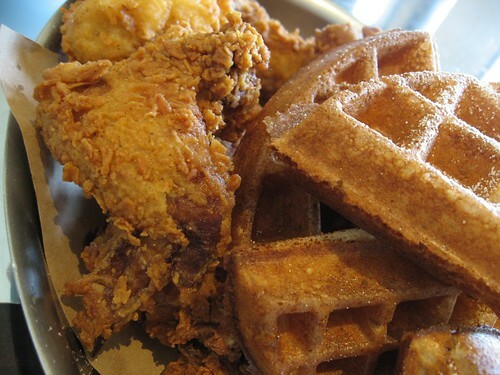 Over the last few years, chicken and waffle options in the Bay Area have improved, especially when the Home of Chicken and Waffles, which was originally slated to be an official Roscoe’s franchise before the owners decided to do their own thing, opened a few years ago in Oakland’s Jack London Square. It still isn’t Roscoe’s, but it satisfies the craving. The most decadent versions of chicken and waffles I’ve had have been at Sunday brunches at Thomas Keller’s Ad Hoc in Yountville. 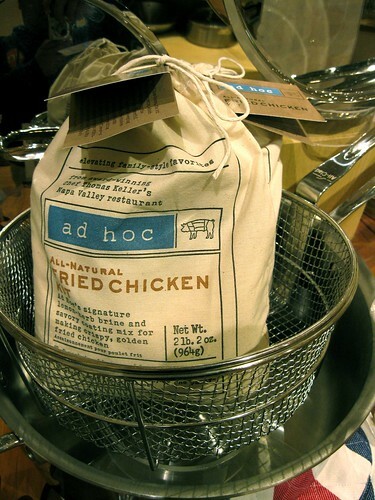 Ad Hoc’s fried chicken is so popular that it has developed a cult following and is the featured entree at the restaurant on alternating Mondays. 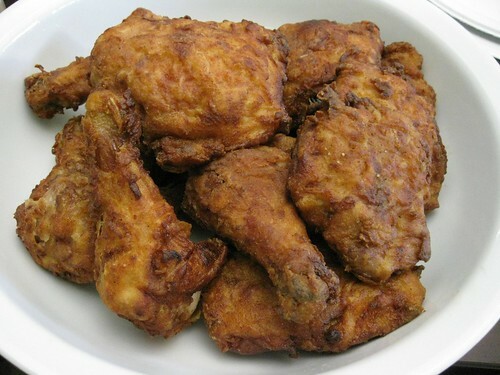 The recipe was first published in Food and Wine magazine a couple years ago and my post about making the fried chicken is one of the most visited pages on this site. 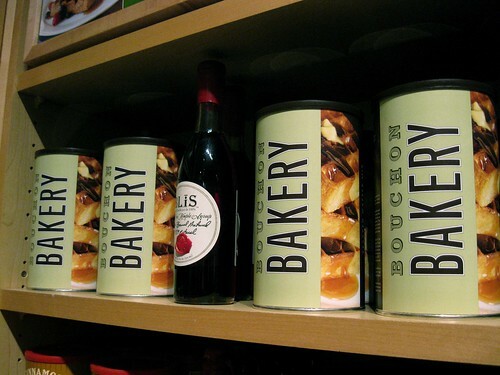 …that also includes the Bouchon Bakery line of products. When I saw the Bouchon Bakery Yeasted Waffle mix, I decided that this 24, 24, 24 event was going to turn into a throwdown: the Ad Hoc Fried Chicken Kit v. Ad Hoc fried chicken from scratch and the Bouchon Bakery Yeasted Waffles mix v. the Best (and Easiest) Yeasted Waffle by Sheryl at Crispy Waffle. I deviated from both recipes instructions by cooking the chicken sous vide before dredging and frying. I do this because I’m paranoid about undercooking chicken, and cooking it sous vide for an hour at around 140F/60C ensures that the chicken is cooked and helps keep it juicy. This allows me to focus solely on the color of the fried chicken when it’s frying in the oil. It doesn’t look that appetizing fresh out of the water bath, but after dredging and frying, it’s heaven. On the surface, both batches of fried chicken I made looked identical, but on flavor, the scratch recipe beat the kit by a mile. The main difference between the scratch recipe and the kit is in the brine. The scratch recipe’s brine calls for fresh herbs and spices, honey and lemons, and these flavors really come through in the final product. The “scratch” batch of fried chicken. The fried chicken kit relies on a brine packet of dried spices and seasonings instead of fresh, but the most glaring omission was the lack of lemons. As a result, everyone who tried the kit’s fried chicken said it had a strong pepper flavor. I wonder if lemon powder could have made a significant difference, but I think the inclusion of fresh lemon zest and juice into the brining liquid would have been a pretty simple step for most home cooks. 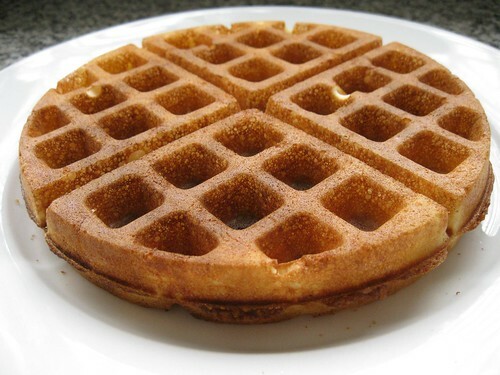 Although we were dealing with two yeasted waffle recipes, there were a couple differences in how they’re put together. Sheryl’s recipe uses dry instant yeast and calls for a refrigerated overnight rise, while the Bouchon mix uses active dry yeast that is proofed for 10 minutes before mixing the batter and has a rising time of 90 minutes. Sheryl also adds a couple teaspoons of vanilla extract to her batter. 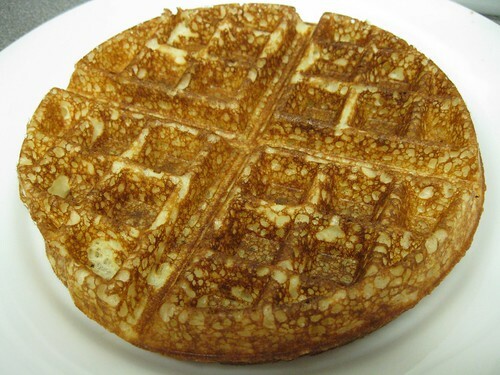 The Bouchon Bakery mix produces waffles that are incredibly light and more delicate than Sheryl’s waffle, which can be good or bad depending on your preferences. Personally, I found them to be a little too airy, but I was still astonished at how light and crispy they were. That doesn’t mean Sheryl’s waffle was heavy by an means. It was still light and crispy but had just a little more weight and texture (dare I say gravitas?) than the Bouchon Bakery waffle, as well as a creaminess in the middle that every good Belgian waffle should have. I’ve never been the biggest fan of Belgian waffles, preferring the thinner traditional waffles like the ones they serve at Roscoe’s. I even picked up a traditional waffle iron to test out some buttermilk and cornmeal waffle recipes to serve along side the yeasted waffles, but I couldn’t find one that I liked enough to feature alongside the fried chicken. Sourdough waffles are generally served at Ad Hoc, but I didn’t have a sourdough starter on hand (or the time to start one), so I tabled that for another time. If there’s one thing I learned during my research, it’s that I really like Belgian waffles now, especially the yeasted variety, and I am now in the market for a better Belgian waffle iron, preferably one that flips. I think I’ll save the traditional waffle iron for moffles. Looks like you had an awesome time. What is the water tank you washed the chicken in.. is that something you made or is it a piece of equipment intended to wash chicken in? I wasn’t actually washing the chicken. :) I was cooking it “sous vide” in 140F water. 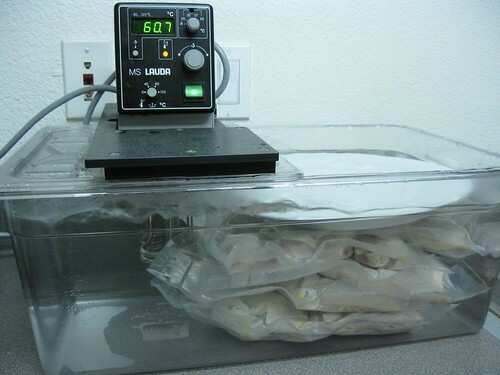 I took the chicken out of the brine and then vacuumed sealed them in plastic bags using our Foodsaver and cooked them in the water for an hour. Since the temperature of the water is constant, the chicken won’t overcook because it will never go above the temperature of the water. 140F is a safe cooking temp. 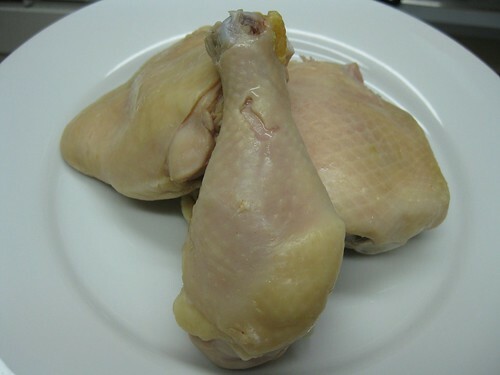 for chicken, but the temperature of the chicken also goes upa little more when its in the oil. The plastic vessel is a standard hotel pan filled with water. The device with the display on it is an immersion circulator that is used to control the temperature of the water and also circulate it throughout the pan so that the temperature of the water remains constant. Can you tell the difference pre-cooking the chicken sous vide versus frying raw? I thought the latter would be moister since pre-cooking means the chicken would overcook as it is “re-fried” so to speak. Just my hypothesis, never tried. bryan, it would only matter if you were overcooking the chicken. In this case, the temperature is only 140F, so I’m actually undercooking it slightly and then finishing it in the oil after it’s dredged and fried. This post is torture! I shouldn’t read it while hungry. Cooking the chicken sous vide is a brilliant idea — especially for dark meat, since that takes such a long time to cook, and normally the breading then turns out too dark. I haven’t been to Roscoe’s in years. You just made me want to go back NOW!!! This is a great post. I haven’t yet had the privilege of eating chicken and waffles together. Thanks for doing this showdown (I am so jealous of your sous vide setup). I want to try those waffle recipes. Do you think there is a way to replicate the Roscoe’s syrup? Roscoe’s syrup is a big secret actually, and I don’t even think it’s all natural. :) They serve it warm, which is something I need to try with our preference, a good Grade A Maple Syrup. The waffles are also really good with honey. I am in complete awe (and envy) of your immersion circulator. I’m gonna have to think of a good excuse to give my wife to convince her I need one! I too love roscoe’s, and I can only imagine how good Keller’s fried chicken is, but man, your version looks killer too. As lovers of all things fried and waffle, we do think this is glorious! We’ve been to Roscoes and Gladys Knights, and it’s always a treat. Definitely better to make it at home though. That whole sous vide idea is amazing. I’ve tried frying chicken a few times, always to have it turn out so dark by the time the chicken was cooked through at the bone. Problem solved. Sounds amazing – I love chicken and waffles! Now, to find the equipment to cook sous vide! Good God I’m hungry now! I guess that’s what I get for reading this first thing in the morning. Arnie, I still remember you taking me and a few other to Roscoe’s for the first time. I’ve only been back once since but I plan on taking my family one of these days on the way to the SCV. WOW -you own a thermal circulator!!! Always love reading about a food showdown, great 24,24,24 post! Melissa, yeah I did see that…Thanks! I’m contemplating changing my blog’s tag line to “surprisingly good” hahaha! What??? When did this happen? Great post! I’d like to make an appetizer version of chicken and waffles for a BBQ I’m going to. I was going to try chicken tenders but I know the cooking time will need to be reduced. Do you think the seasoning for the full recipe will work just as well on tenders? Where is your crispy waffle recipe….I need to make it this weekend…been craving it. Give it to me asap. I like the one u made yrs ago that is light and crispy…it was very airy not dense. Waiting for it…..